MAKE YOUR OWN SLUSHY: SHAKE UP A SODA WHILE ITS STILL SEALE - ProudMummy.com the Web's Community for Mums. 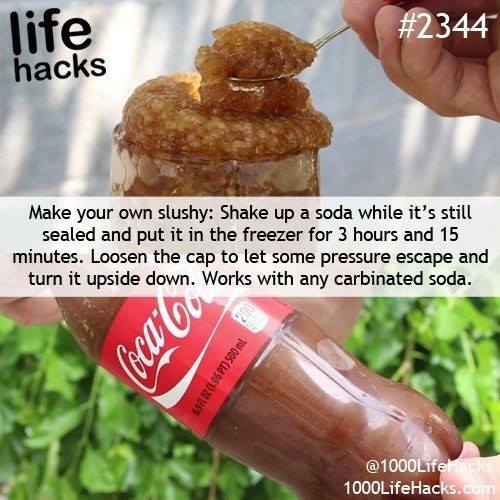 MAKE YOUR OWN SLUSHY: SHAKE UP A SODA WHILE IT'S STILL SEALED AND PUT IT IN THE FREEZER FOR 3 HOURS AND 15 MINUTES. LOOSEN THE CAP TO LET SOME PRESSURE ESCAPE AND TURN IT UPSIDE DOWN. WORKS WITH ANY CARBINATED SODA.